Lately I have been hooked on using wholegrain spelt flour for my quiche pastry. It makes a wonderfully tasty pastry that really enhances a quiche like this broccoli and spinach quiche. I’ve also chosen to use strong-tasting cheese for the filling of this quiche. 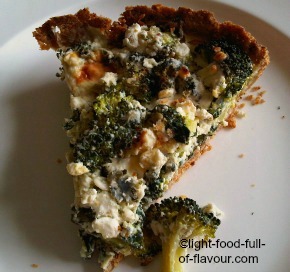 I love blue cheese and I think it goes really well with the broccoli and spinach. But if you’re not a fan of this kind of cheese, chose another strong-tasting cheese like mature or extra mature Cheddar or Gruyère cheese. I stick to my usual measurements for the pastry even though this produces a slightly sticky pastry dough when using nothing but wholegrain spelt flour. This is not a problem though, as I use my hands to push out the pastry into the pie dish (see pastry for quiche below). The end result is a really flaky pastry with a delicious nutty flavour. 1. Preheat the oven to 200C/400F/gas mark 6. Make the pastry for the quiche. Push it out with your fingers into your pie dish and place it in the fridge to chill for 30 minutes. 2. Put a pan with salted water on to boil for the broccoli. When the water is boiling, place the broccoli in the pan, cover with a lid and leave to simmer for 2 minutes only. Drain the broccoli in a colander and leave to cool down. 3. Take out the pie dish from the fridge, prick the bottom with a fork, cover with baking parchment and add whatever baking beans you are using. Bake in the oven for 15 minutes. 4. Put the fresh spinach in a large colander and slowly pour over a kettle of boiled water to wilt the spinach. When the spinach is cold enough to handle, squeeze out as much water as possible with your hands. Finely chop the spinach and leave to the side. 5. Take out the pie dish and carefully remove the baking parchment and the baking beans. Return the pie dish to the oven for another 5-7 minutes until the pastry starts to brown and the bottom of the pastry is properly baked through and dry. 6. Mix together the eggs, cottage cheese, crumbled or grated cheese and a pinch of grated nutmeg. Season with salt and pepper. Spread out the chopped spinach in the pastry case, place the broccoli on top and pour over the egg and cheese mixture. Bake in the oven for around 30 minutes, until the broccoli and spinach quiche is nicely browned.